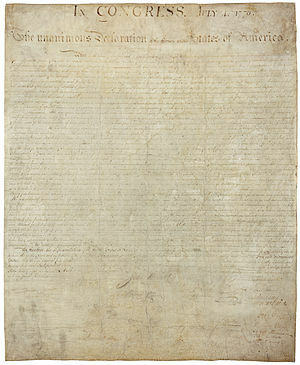 By invoking the “Laws of Nature and of Nature‘s God” the 56 signers of the Declaration incorporated a legal standard of freedom into the forms of government that would follow. The theory of freedom adopted was simply that God’s law was supreme and gave freedom. The phrase “Laws of Nature and of Nature’s God” referred to the laws that God in his capacity as the Creator of the universe had established for the governance of people, nations and nature. These laws are variously described as the laws of Creation, God’s Creation laws or as the framers elected to refer to them, as the laws of nature and of nature’s God. This body of law, whatever it is called, can be ascertained by people through an examination of God’s creation, the text of the Bible, and to a certain degree, instinct or reason. In contrast to God’s law, the civil laws of nations are not written on anyone’s conscience or mind. They are not written in the physical creation. Nor are they appended to the Bible. The civil laws of nations are only written in their own lawbooks. Consequently, the validity and force of such laws are based solely on national authority. There is no other supporting evidence or “witness” to testify for the validity of specific civil laws. This shortcoming, however, is not necessarily a fatal one. In order for the civil laws of any nation to be authoritative, they must at least be supported by the testimony of another source and that they are consistent with God’s delegation of authority to civil governments. In order for the laws of a nation to be valid, they must at the very least harmonize with, and not contradict, the law of God. We know the law of God by looking to its expressions. If the laws of a nation conflict with one of the expressions of the law of God, then something is amiss. Or, perhaps we do not understand one or the other clearly. The optimum situation would be where the laws of a nation are consistent with each of the expressions of the law of God. But, perhaps the best that can be generally hoped for is that civil laws be found to not contradict the most universal expression of the law of God in creation – the law of nature. The heavens and the earth declare that law. Thus we may deduce a rule to guide us: only when civil law does not contradict this fundamental and universal expression of the law of God can it be recognized as prima facie valid. That is to say, civil laws, so far as can be judged from first appearances, are valid if they do not violate God’s law as reflected in the law of nature. And we can know if our interpretation of the law of nature is correct if it comports with the Bible. Consistency with creation, therefore, is the minimum test to validate the laws of nations. Historically, this was recognized in the legal maxim, lex spectat naturæ ordinem, the law regards the order of nature. A law which fails this initial test is of no binding legal effect because it remains unsupported. Every civil law requires the supporting testimony of the law of God in at least one of its expressions in order to be of binding effect. Indeed, no nation should be bound to a malum in se rule or law simply because it is written in a statute book. assume among the powers of the earth…. Governments were instituted to protect that right from the unbelieving sojourners. The phrase “god of this world” (or “god of this age” indicates that Satan is the major influence on the mind-set expressed by the ideals, opinions, goals, hopes and views of the majority of people. His areas of influence also encompass the world’s philosophies, education, and commerce. The thoughts, ideas, speculations and false religions of the world are under his control and have sprung from his lies and deceptions. This is not to say that he rules the world completely; only God does this. But it does mean that God, in His infinite wisdom, has allowed Satan to operate in this world (within the boundaries God has set for him) and has allowed Satan to operate with an agenda. When the Bible says Satan has power over the world, it must be made clear that God has given him domain over unbelievers alone. Believers are no longer under the rule of Satan. Unbelievers, on the other hand, are caught “in the snare of the devil”..
Satan’s agenda includes pushing a false philosophy onto the unbelieving world—a false philosophy that blinds the unbeliever from the truth of the Gospel. Satan’s philosophies are the fortresses in which people are imprisoned, needing to be set free and brought captive to Christ in obedience to the truth. ( a decent respect to the opinions of mankind requires that they should declare the causes which impel them to the separation. as Free and Independent States……. And for the support of this Declaration, with a firm reliance on the protection of Divine Providence…..
1. of or pertaining to a god, especially the Supreme Being. 3.proceeding from God or a god: divine laws. God, especially when conceived as omnisciently directing the universe and the affairs of humankind with wise benevolence. with a firm reliance on the protection of Divine Providence…. This entry was posted in Gospel Ministry and Words to Inspire, Ministry Notices, Public Notices and tagged 2012, American Revolution, Bible, Declaration, Declaration of Independence, Divine law, God, Minister Joseph Kirk, Ministry of Jesus the christ and His Holy Church, Nature, Thomas Jefferson, United State, United States Declaration of Independence.